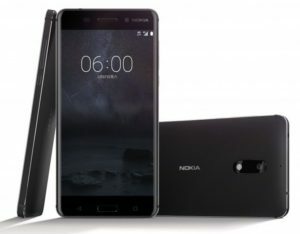 The Nokia 6 is bringing the Nokia name back to the Smartphone Market. HMD bought the Nokia rights from Microsoft last year and will make the Android Powered Nokia 6. The BlackBerry Mercury is bringing the BlackBerry name back with the classic physical QWERTY keyboard but now with the Nougat version of Andriod. The Blackberry Mercury will come decked out with a high resolution 18 Megapixel Camera and also a selfie inducing front facing camera. 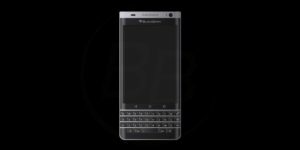 The BlackBerry Mercury will be made by TCL under the Alcatel name. The smart phone has iPhone like round corners and will be powered Qualcomm’s Snapdragon 625 processoraccompanied by 3GB RAM. Neon Genesis Evangelion will love this phone, Sharp Neon Genesis Evangelion SH-06D Android Phone. Only be 10,000 of the phones available, but they will only be sold in Japan. It features a heavily customized case, hardware buttons and 3D Android 2.3 skin designed to reflect its heritage. Pre-orders start today, and the phone officially goes on sale June 29. 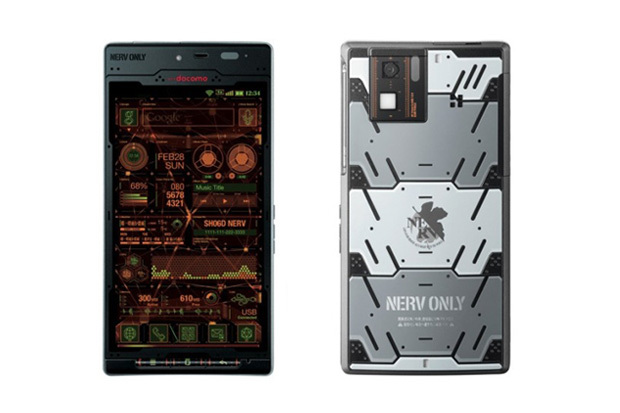 The Sharp Neon Genesis Evangelion SH-06D Android Phone will be priced at around ¥25,000-¥30,000 JPY (approximately $315-$377 USD). Is the Galaxy Nexus the Phone to get? 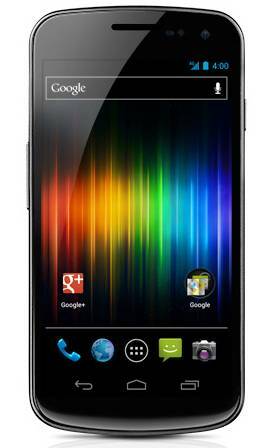 The Galaxy Nexus is a touchscreen slate Android smartphone developed by a partnership between Google and Samsung. 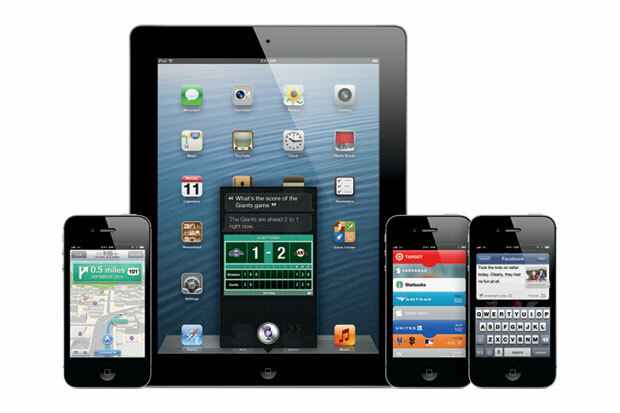 The phone and operating system were developed collaboratively by engineers from both companies. 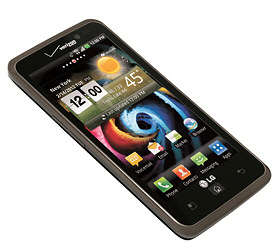 It is the third generation successor to Google’s previous flagship phones, the Nexus One and Nexus S. It has an HD (720p) Super AMOLED display with curved glass, an improved camera system, and Google’s new version of its Android operating system, version 4.0, codenamed Ice Cream Sandwich. The name is the result of co-branding between the Samsung Galaxy and Google Nexus brands of Android smartphones. The Galaxy Nexus features a 4.65-inch 1280×720-pixel HD Super AMOLED PenTile curved glass display, a dual-core 1.2 GHz TI OMAP 4460 processor (ARM Cortex-A9) with an accompanying PowerVR SGX540, 1 GB of RAM; a 1,750 mAh battery (1,850 mAh LTE version); 1.3 MP front camera and 5 MP rear camera (with zero shutter lag) capable of 1080p video with the rear camera and 720p with the front camera; 4G; Wi-Fi a/b/g/n; Bluetooth; GPS, barometer; NFC; and 16 GB or 32 GB of internal storage. The Samsung Galaxy Nexus is the first device running Android 4.0 Ice Cream Sandwich. The HSPA+ GSM version is a pentaband device, able to utilize 3G networks nearly anywhere in the world. In terms of hardware, the Galaxy Nexus features a 4.65-inch 720 Super AMOLED HD display, 16GB or 32GB of on-board storage, 1GB of RAM, and NFC technology. The Galaxy Nexus is a new phone in the series created by Samsung. It’s the third official phone contracted by Google and the first phone to come with Android 4.0 Ice Cream Sandwich. Specs include a 1.2GHz dual-core processor, 1GB of RAM, 16/32GB of internal storage, a 4.65 inch 720p HD Super AMOLED display, a 5 megapixel camera with 1080p HD video recording, a 1.3 megapixel camera and a lot more. The phone features NFC-based sharing with a feature called Androdid Beam, face-recognition unlocking, advanced battery and data monitoring options and a lot more that is possible with the advent of Android 4.0. Apple has demonstrated the new iOS 6 today at WWDC (World Wide Developer’s Conference). The guys at apple really spent thier time on this one with over 200 improvements for the next-generation mobile platform. the best ever in a mobile device, allowing you to sign in once and post from Notification Center, Siri and Facebook-enabled apps, including Photos, Safari and Maps. Your Facebook friends’ information is kept up to date across all your iOS devices, automatically updating details in Contacts when they change, and scheduling events and birthdays in your Calendar. You can also “Like” content directly from the App Store™ and iTunes® and see what your friends recommend. 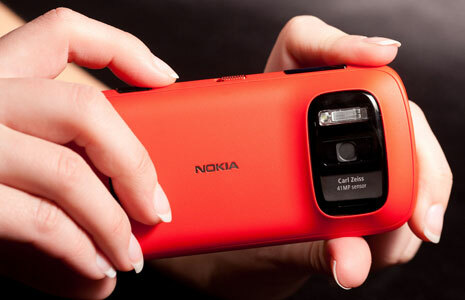 Nokia 808 Pureview Smartphone to come with 41 Megapixel Camera… Yes 41 Megapixels! 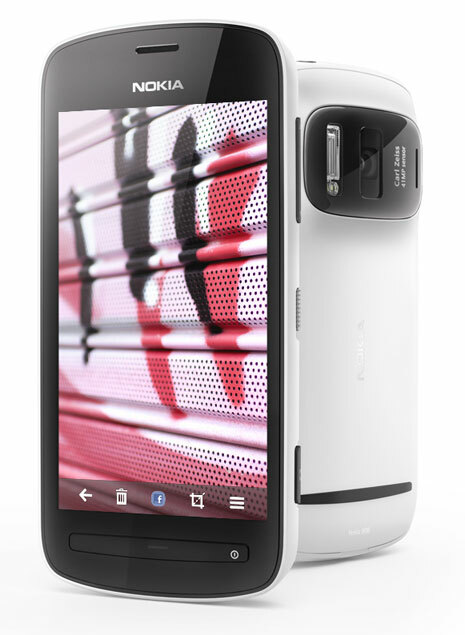 The Nokia 808 Pureview is Nokia’s latest entry in the Smart phone arena. It will comw with a 41 Megapixel Camera equipped with a Carl Zeiss Lens. It will also shoot Video in full HD, and do the rest of stuff all Smart Phones do. “Sorry, did you just say 41-megapixels? Yes, that’s right. But this combination isn’t about shooting pictures the size of billboards! Instead, it’s about creating amazing pictures at normal, manageable sizes. There’s a combination of benefits. I’ve seen quite a bit of smartphones, and thier screens damaged in the last few years. 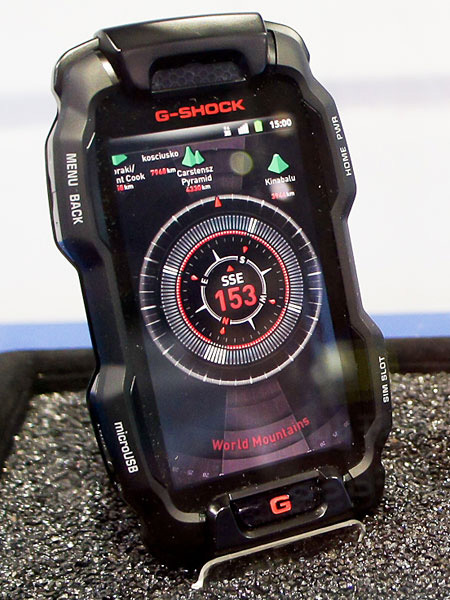 Casio came out with a gread idea: the G-Shock Android Smartphone, what a great idea. We all know the G-Shock name to be synonmous with toughness and water resistance. I actually had a friend spill a drnk on my previous phone, so im sure this would of been handy. Looks are subjective, but I think this is a great looking phone! This is the LG Spectrum on cellular carrier Verizon. Now the HD experience you get at home is on your phone. The Spectrum™ by LG has a vast 4.5” True HD screen makes movies more cinematic and TV more memorable with more realistic and natural–looking color. Get your fill of your favorites with Verizon 4G LTE and a screen that dazzles even in direct sunlight. Protected by Corning® Gorilla® Glass. There’s no waiting to watch, with pre–loaded premium apps like Netflix, Verizon Video, and ESPN ScoreCenter with HD video. Enjoy hours of entertainment from the palm of your hand. Then tap into the Android Market and access an ever–expanding array of apps. Pretty interesting, but is this even legal? 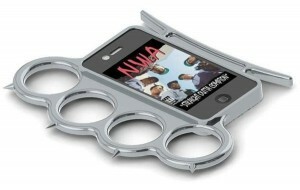 “We’ve seen some pretty interesting iPhone cases in the past, and if you enjoy the idea of being able to turn your iPhone case into a weapon, you might be interested in checking out this particular rendering of an iPhone case that looks like it could double up as a set of brass knuckles, although in this case it looks more like stainless steel rather than brass, but we think you get the drift.